With the United States Department of Agriculture announcing meat substitutes in school lunches nationwide, replacing meat with equally protein-rich alternatives, we're starting to witness a sea change in national dietary guidelines. And it's about time. Our current approach to diets is unsustainable. Federally appointed health experts serving on the Dietary Guidelines Advisory Committee agree with this assessment and recommend a rethink on the future of American food and nutrition programs. The American public will want to pay attention, as the committee's findings will have a major impact on what we eat. In submitting a scientific report to the Secretaries of the U.S. Department of Health and Human Services (HHS) and the U.S. Department of Agriculture (USDA), this year's committee recommended less meat and more plants as essential for the health of America's population and the planet. I agree wholeheartedly, as do hundreds of prominent environmental and health leaders who submitted their own letter to HHS Secretary Silvia Matthews Burwell and Agriculture Secretary Tom Vilsack, encouraging the adoption of sustainability standards and considerations. Influencing the Dietary Guidelines for Americans, a document published every five years by the USDA and HHS that guides U.S. food programs and nutrition policies, is a crowded and competitive space as innumerable meat and dairy industries are also interested in altering outcomes and have been fighting the committee's recommendations. Industry realizes how big of a deal it is for HHS and USDA's own Dietary Guidelines Advisory Committee to call for plant-based diets. This is unprecedented. It's unsurprising that industry would be on the defense. The impact of the guidelines on American health and environment is substantial. It comes with the added benefit of modifying the National School Lunch Program and MyPlate (previously known as the food pyramid) and subsequently impacting millions of American diets, and millions of square miles of American farmland as well. Industry, however, can't keep driving our country's dietary priorities, especially if it flies in the face of what we already know regarding what's good for the planet and good for the American people. There is no question that a plant-based diet is key to sustainability and our survival. First of all, there's no way we can keep global warming below the 2oC limit, beyond which we will witness catastrophic climate change, if we don't radically reduce our meat and dairy consumption. For example, on the production front, we know that a unit of beef protein contributes 150 times more greenhouse gas (GHG) emissions than a unit of soy protein. That's a whopper of a difference. 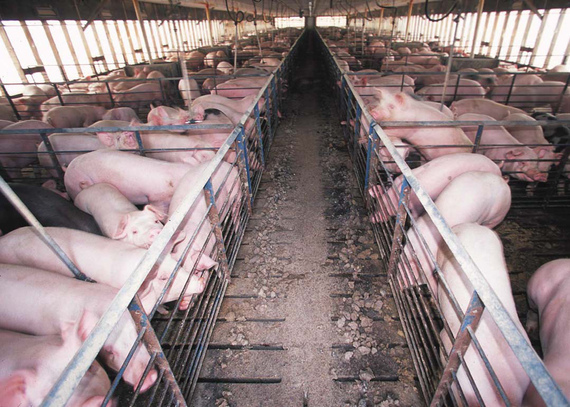 Pork and chicken also have a heavy carbon footprint but are only 20 to 25 times heavier in GHGs than soy. Additionally, cows, and their methane, are responsible for 65 percent of livestock emissions, more than any other species, and beef production requires nearly 30 times more grazing land than chicken or pork production. It's not just the environment that benefits from an immediate implementation of the committee's dietary recommendations. Our health benefits as well. We need to shift away from diets featuring a heavy intake of meats (along with refined sugars and fats and oils), all of which is expected to increase agricultural emissions by 80 percent by 2050. By doing what's sustainable for the planet, we also help prevent diabetes; heart disease; colorectal, ovarian and breast cancer; obesity; high blood pressure; and other diseases that lower life expectancy. The good news is that we can do all of this without costing consumers more. By reducing animal products, we're cutting out the middle person, which in this case is the cow, pig or chicken, and we're going directly to the source: plants. We increase agricultural efficiency and effectiveness and ultimately feed more people. A Dutch study predicts that roughly 10.4 million square miles of grazing land would be immediately available, as well as 386,000 square miles of land that is currently growing crops for livestock. As our population continues to grow (the U.S. has one of the fastest population growth rates in the developed world), we must think creatively and courageously about more sustainable diets. We simple do not have sufficient energy and water resources for a diet heavy in animal protein. The science committee points another path forward for USDA and HHS, and it's one we must adopt soon. Do it for the health of this country. Do it for the American people. Do it for the heartland. Michael Shank is adjunct faculty at George Mason University's School for Conflict Analysis and Resolution and writes in his personal capacity as a vegetarian for over 20 years and, more recently, as a vegan.